Skinetica was one of those brands that Glossybox introduced to me. They included a small sample of the anti-blemish in their October box. It wasn't a big enough sample to really try out and see if it worked for my skin but I was kindly sent a full sized bottle*. 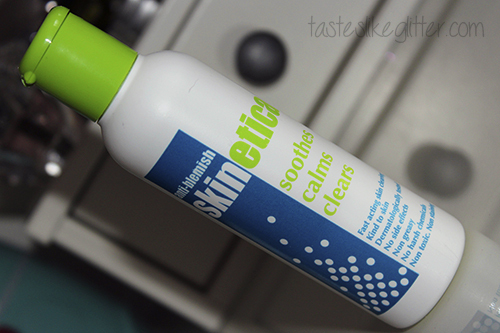 Skinetica - skin clearing and blemish removal, fast acting - soothes, calms and clears. Skinetica is a genuine product that actually does what it says on the bottle! A unique new solution that clears unsightly breakouts with visible improvements in 2-3 days. Skinetica is a gentle blemish treatment that only contains 4 ingredients - purified water, ethyl alcohol, fragrance and quaternary ammonium chloride. Unlike treatments I'm familiar with it doesn't have an over powering scent of alcohol. It has quite a fresh scent that isn't too strong. There is one rule with Skinetica and that is to apple twice daily and wait for it to air dry before putting anything on top. I apply with a cotton pad after cleansing and let it sink in. It doesn't leave a tight feeling once it's sunk in. Then I apply moisturiser and makeup like normal. This didn't completely rid my breakouts but I found the appearance of anything that came up look more reduced then normal. I also found any monthly breakouts became a lot less painful than before. Overall I really rate this product. It seems a lot kinder on the skin than anything I've tried previous. Whilst it does contain alcohol it doesn't in anyway leave my skin feeling dry. If you want to try Skinetica, they're currently running an offer where you can get a free 3 day sample by going here.